사명대사(1544~1610)는 임진왜란 때 의병과 승병을 일으켜 나라에 큰 공을 세운 인물이다. 이 유물은 사명대사가 착용했던 가사와 장삼이다. 가사는 승려들이 입던 법의(法衣)로 장삼을 입고 그 위에 왼쪽 어깨에서 오른쪽 겨드랑이 밑으로 걸쳐 입덧 옷이다. 장삼은 검은색이나 흰색으로 만든 길이가 길고 소매가 넓은 옷으로 가사와 함께 승려가 입는 법복 중 하나이다. 사명대사 금란가사는 황금색의 중국 비단으로 만들었는데, 현재는 담황색으로 변색되고 훼손도 심하여 본래의 모습을 파악하기가 힘들다. 흰색 무명으로 만든 사명대사 장삼은 상의와 하의가 연결되어 있으며, 군데 군데 훼손은 되었으나 원형을 보존하고 있다. 사명대사 금란가사와 장삼은 착용자를 알 수 있는 유물로서 16세기 말에서 17세기 초 승려들의 복식을 연구하는데 귀중한 자료이다. These are the outer vestment and robe worn by Samyeong (1544~1610), who is counted one of virtuous monks of the Joseon Dynasty. Samyeong mobilized a volunteer army and monk soldiers during the Japanese invasion of Korea in 1592, and rendered distinguished services to the state. The outer vestment is a sacerdotal cloth made of golden silk imported from China. It is 270cm wide and 80cm long. 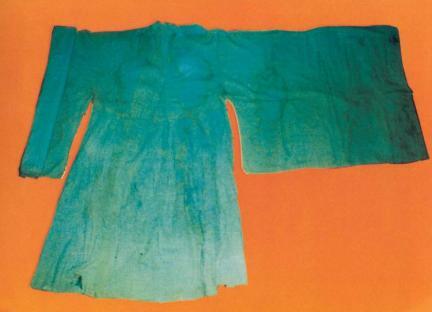 By now, the color of the robe is faded to a lemon yellow and its shape has been damaged badly, so it is hard to recognize its original shape. The Buddhist robe is made of black or white fabric and has wide sleeves. 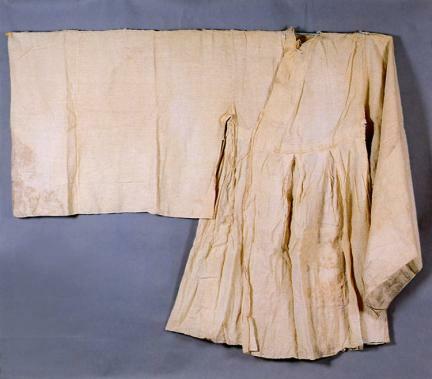 Samyeong’s robe was made of white cotton. 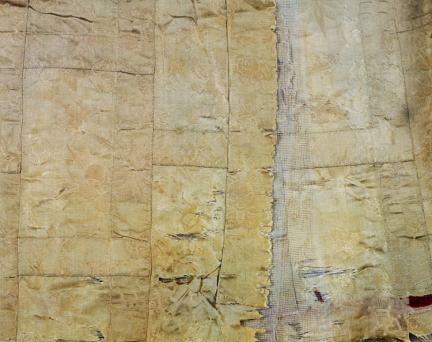 The top and bottom are connected, and though part of the robe is damaged, the original shape is relatively well preserved. The robe is 144cm long and 55cm wide and has short breast ties. The length of the sleeves is 143cm. These Buddhist clothes are considered precious artifacts for the study of Buddhist robes during the late 16th to the early 17th century.